Welcome to the Eighty Forth Edition of the Owen Guns Bulletin. STOP PRESS Classified Guns for Sale – ADVERTISE YOUR GUNs HERE. Selling guns so fast than we cannot photograph them and get them up there quick enough. We need yours to sell on Electronic Classifieds! Only $10.00 and you can place three photo’s of your item. Big thing are happening at Owen Guns, shortly we will be opening our new larger firearm showroom. Over twice the size of our current Gun Room. 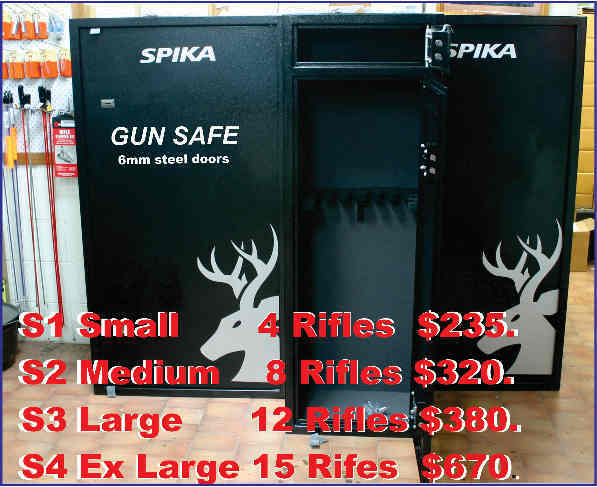 Displaying an extra 300 firearms, Owen Guns at Gympie will have our own Gun Shows permanently so please call in to see us. PHONE 07 54825070 for the best price and availability of Sako, Tikka, Browning, Remington, Marlin, Zastava, CZ, or any other brand you can think of. Ron Owen. 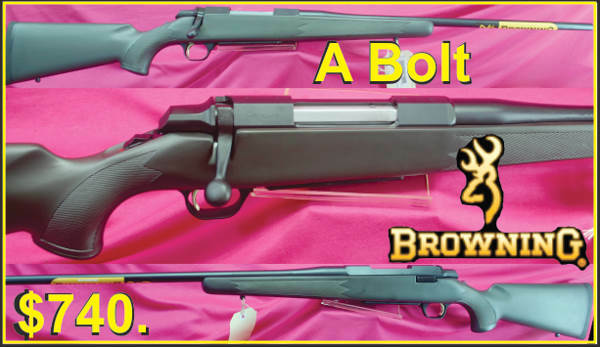 Browning A Bolts .223, .243, .270 and .308 win to 30-06 springfield $740. 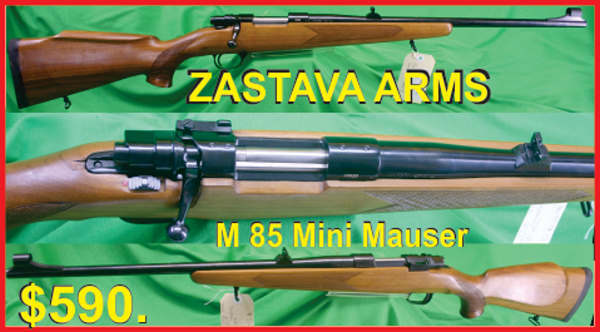 Zastava Model 85 Mini Mauser in .223 and 7.62x 39 (.22 Hornet expected later this year) $590.00. We may be forgiven for believing that a Liberal/National Government would be more honest than a Labour Party Government as with Labour we were so used to lies, we expected it. When 18 months ago the Lib/Nat party promised a 20 % reduction in paperwork law abiding shooters, as the section of our community with the greatest burden imposed on them, were justified in expecting some improvements. When they were overwhelmingly swept into office, shooters were promised a Ministers Advisory Panel that would review all of the legislative burden imposed on us. We had an Amnesty and we are told that 19,000 firearms were placed on the State register to shooters licences without a Permit to Acquire. 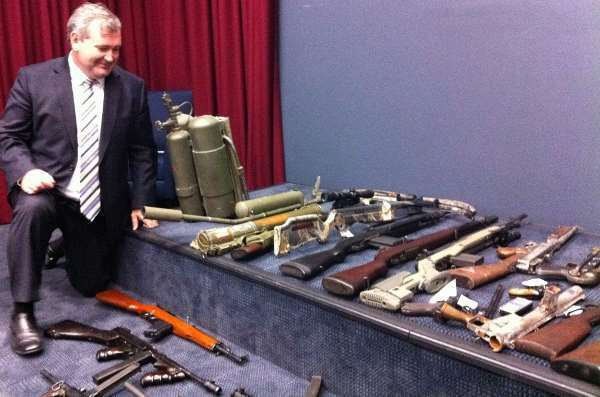 Some of the museum pieces that unfortunately were handed to Police Stations and were not able to go on a Shooters Licence. This provision in this section, made the registering and acquisition of those 19000 firearms to shooters licences possible, as the lawful authority is the licence. Yes, there are provisions for a PTA, but when the person applies for a licence, in a certain category the authorised officer, makes a decision to approve that the applicant has that genuine need and once approving that licence, the Act is satisfied. Provision 35 ( c) also allows the Dealer to exchange a firearm for warranty, or a repair. Apparently one dealer in the State of Queensland has special permission as a test, to take a firearm off a customer, and sell him another in the same calibre, without a PTA. Again Section 35 ( c) would apply. If it applies to one dealer, why cannot it apply to every dealer? This would allow those hundred of staff in Weapons Licencing to retire and go home to their families. Up to date, answers from the Minister and his Chief of Staff have omitted to explain , “the person acquires the weapon under other lawful authority, justification or excuse.” Which allows the Dealer to sell or dispose of a firearm without a PTA and admit that was the provision used during the Amnesty. The Minister Office has lied by saying this was a provision of the amnesty and of course that is not in the Act at all. As well as lying to the law abiding shooter of Queensland they have also lied to Members of Parliament who have written on behalf of their constituents. “A truth that’s told with bad intent Beats all the lies you can invent.” William Blake, Auguries of Innocence. 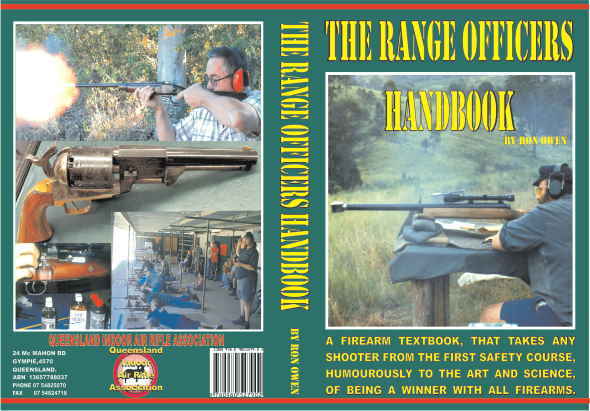 1) Is section 35 ( c) “the person acquires the weapon under other lawful authority, justification or excuse.” the law that can be applied in Queensland to acquire a firearm, or not? If it is, it makes the Permits to Acquire a superfluous fund raiser for the QPS. 2) Has at the date of the 25th September the Minister of Police or his Chief of Staff referred this point to the Ministers Advisory Panel? If not he has lied to Members of Parliament and the Public. 3) Why should we vote for our local representative, if our local representative do not raise these ‘Ministers responses’ that lie to their constituents, in open parliament? Tell them that if we can read it in Hansard and know that our elected representatives is representing licensed shooters, exposing these lies, then they will get our vote and if not they won’t. You can find his or her email, fax mail address in this list, http://www.qgd.qld.gov.au/legislative_assembly.html#addresses , in fact if you feel disposed send them all one. Remember Albert Einstein said “The world will not be destroyed by those who do evil, but by those who watch and do nothing.” Go on have a go its easy, become a voice for justice, a voice for freedom, lets seize the day, we have nothing to lose but our chains. Write a letter or send by email, no other group or association is going to do it for you. We are it. We are the Firearm Lobby. Sabatti 300 Win Mag, .308 Win, .243 Win $850. Savage/ Stevens 7mm Rem Mag, 25.06 Rem, .270 Win. $650. Mossberg, Maverick .308 Win, 30-06 Spfd, .270 Win. $399. 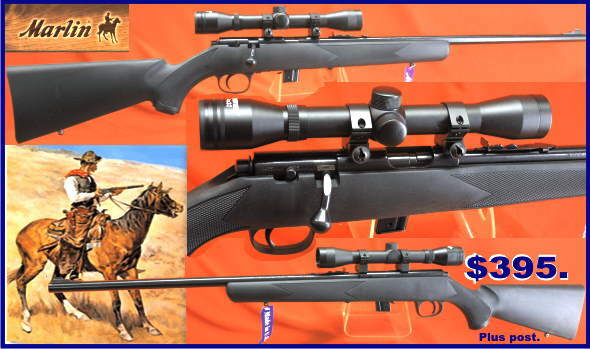 Marlin X7, Series .223.270 WIN, .308 Win, 30-06 Spfd, $545. Marlin Lever Actions 336 W , Laminate Stocks, 30-30 Win $720. Remington Model 770, .243 Win, .270 Win, .308 Win, 30-06 Spfd. $480. Ruger M77 Stainless .204 Ruger, $1000. Tikka, T3 .243, Win, 6.5 x 55 Swedish, $990. Zastava .22-250, 243 win Rem Stainless $620. Zastava Blued with Walnut stock in .243 win and 6.5 x 55 S $620. Remington Model 7600 Pump .308 Win $1350. plus post Remington Pump in .223 with Ghost Ring $1495. SIGN ON LINE PETITION AGAINST USELESS GUN LAWS. NEWS YOUR NOT SEEING IN MAIN STREAM MEDIA. History does not entrust the care of Freedom to the weak, or timid, D.D. Eisenhower. In my past lives, as Grenadier Guard, a Prison Guard, a Mechanical Engineer I was also a motor bike enthusiast British Bikes from the 1950 and 60s, so I have no axe to grind at all at Bikies, I also was thrilled by the patriotic two million bikers ride to Washington, and wish something similar could happen here. Why I am raising this is that we shooters are suffering from what the media are calling Bikers Gangs shooting in Sydney and now the Gold Coast. That allows the Anti Gunners to beat the drum and they dance around the drum in a frenzy licking their lips on the tasty entrails of the dead and wounded washing themselves in blood blaming the evil firearm. They remind me of witches of Macbeth, hubble bubble toil and trouble. They have the ability to drum up a story for the media which the media repeats like a repetitive learning service, serving the public like Dr Pavlov feeds his dogs. Feed them rubbish, and ring the bell, then no food, and then just ring the bell and measure the salivating response from Gun Control Australia, all five of them. I am not cross with bikkies, like all of us there will be good and bad, but I am cross with the media as they have been miss informing us on this issue. Yes in truth a Drugs and Crime, turf war, but who are these people? Apparently the violence is between rival Islamic Gangs, such as Finks, and the Soldiers of Islam, Brothers of Islam versus the next Muslim gang. Don’t know which way around but the same Sunnies verses Sheites, problem that they have brought with them to Australia. “’Behead all those who insult the Prophet”, on a poster at a recent Sydney Demonstration. The Sunnis and Shi’ites may not have much love for each other, but they seem to have even less for the country which feeds them. People are starting to notice that in greater numbers. After the recent eruption of violence at Sydney Airport between gang members, Sydneysiders, people on the spot, came to understand that people like Mick Hawi, leader of the Comancheros, had an Islamic background and that many of the group he led did too. This was the first time that some people had ever heard of this. The rest of Australia, are still blaming bikkies. Now, it turns out that disaffected Muslim youth are feeding into the bikie gangs and leaving their stamp on them . According to a Daily Telegraph report, it is Middle Eastern youth who are being particularly recruited and injecting a new note of terror into what was previously just a counter cultural way of life. Senior police sources revealed they are extremely concerned about the emergence of what they call the Muslim “feeder” gangs. Youths of Middle Eastern background have become easy pickings for bikie gangs seeking to boost numbers to gain supremacy over rival gangs. Members of the Muslim Brotherhood Movement have even dropped the Koran from their colours, replacing it with a Harley-Davidson logo. The 600-strong M.B.M. , the emblem of which features two crossed swords, is made up of young, predominantly Shi’a Muslims from Sydney’s southwest. Similar to the Comanchero bikie gang whose boss, Mahmoud “Mick” Hawi, is a Shi’ite. It is not just a matter of bikie gang against bikie gang but also one of Sunnis against Shi’ites and some or all of them against the ‘skips’, the more Aussie Aussies. Racism was becoming a growing factor in the bikie feuds, according to sources. “There’s Notorious and Commanchero against the Hells Angels, who they call the skips, the whiteys,” a source said. Ten years ago the club members were almost 100% white anglo saxons, but now they are almost 100% Lebanese Muslims. I have no idea how it happened and no idea where the original (Caucasian) members have gone. So shooters are being put into the target, and the politically correct mainstream media will not come out and identify these shootings as a racial/ religious war. Shooters are just the meat in the sandwich again. Ron Owen. The Crossman Raven .177 Air Rifle a School Holiday Bargain for $145. Only 10 left in stock.